These are just funky-looking little breadsticks, aren't they? But don't let their appearance fool you - they're really tasty (even kid-approved). 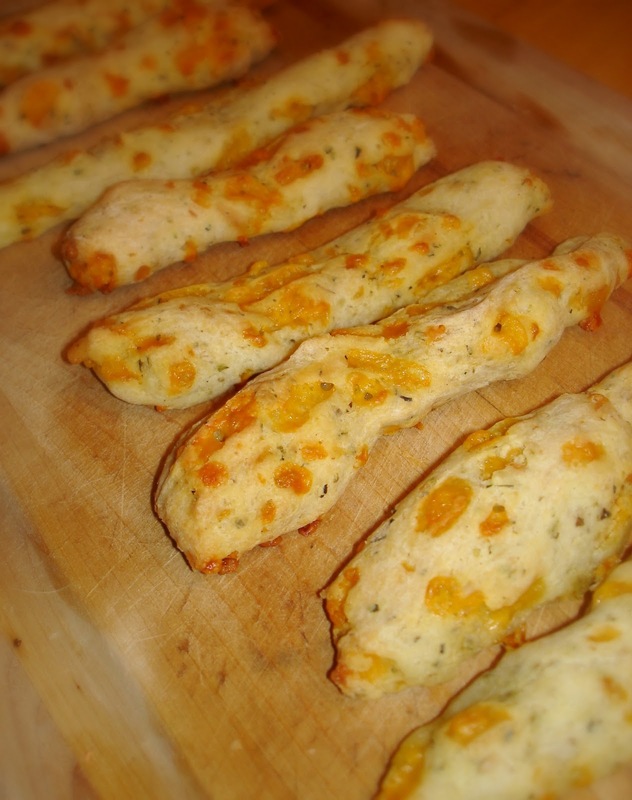 These breadsticks are made from Chebe (pronounced chee-bee) Pizza Crust Mix. The package acclaims the slogan "Slightly unusual. Unusually good." I agree. They're unlike any breadstick I've ever had. But they're super good. The mix is based on a Brazilian cheese bread. The texture is crispy on the outside and soft and chewy in the middle. The package gives you instructions on how to make breadsticks, pizza dough, calzones, soup bowls, crackers, sandwich buns and pigs-in-a-blanket. And the attractive part for many who struggle with food allergies is that the mix is gluten-free, yeast-free, soy-free and dairy-free. Tapioca flour is the main ingredient in the mix, so this product is allowed at 12 months on the MSCD. The package instructions tell you to add milk or a milk substitute to the mix. Brown rice, almond or goat milk works well if you are avoiding dairy products. And you are instructed to add Parmesan cheese, but that is completely optional. I did add cheese to the sticks in the picture, but I was out of Parmesan, so I added shredded cheddar. The other ingredients you'll need to add to this mix are eggs and extra virgin olive oil. I also like to add some seasoning like sea salt, garlic powder and Italian seasoning (basil, oregano, marjoram, thyme, rosemary, sage). There are 6 different Chebe mixes, all reasonably priced. I've been able to find their products pretty easily, both in health food stores and in grocery stores, usually in the gluten-free section. I love the breadsticks so much that I've never tried any of the other recipe options, so if you do, let me know how it turns out! We usually eat these breadsticks with our pasta, but tonight I had a couple breadsticks leftover, so I made a dipping sauce. Stir together tomato sauce, Parmesan cheese, drizzle of honey, garlic powder and Italian seasoning. Simmer for a few minutes. Warm up the breadsticks and dip away! I ate this with a salad - a light but filling supper. Can these be made with the All-Purpose Mix? You can roll any of the 6 mixes into breadsticks, make rolls or roll out into a pizza crust. The dough is very versatile and easy to work with. I've never tried it, but I bet they can. Most of the mixes seem to have pretty similar ingredients. I have found with your almond flour pizza crust you can add 1 tbsp coconut flour and it makes it much more managable. That's a great tip, Belle! Thanks. At the time I wrote the book, I had not yet experimented with coconut flour, but now I use it all the time. Really love the flavor and moisture it gives to recipes. Gluten-free goodness!